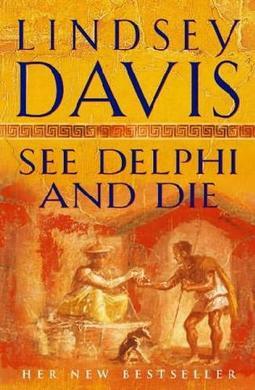 Having fully indulged her hostility toward building contractors, lawyers, and newspapermen in the previous books, Lindsey Davis now takes the opportunity in See Delphi and Die to lampoon the travel industry. While Aulus, Helena Justina’s stuffy younger brother, is traveling to Athens to study law, he runs across a suspicious death in the city of Olympia. A young woman, recently married and on a honeymoon travel tour, is found battered to death outside a gymnasium. Aulus befriends the bereaved groom and, having learned a few detecting skills from his brother-in-law Marcus, takes an interest in the affair. Concerned that Aulus will never commence his education in Athens, Helena’s mother insists on Marcus heading to Olympia to investigate the case. Helena Justina has always wanted to tour Greece and see some of the wonders of the world, so the whole family goes along, complete with two unruly infants, two rapscallion nephews, their teenage foster daughter, and the son of Marcus’ personal trainer. The Falco entourage joins up with the ill-fated tourists at Olympia where it is an off-year for the Olympic games. Marcus interviews each member of the tour and their smooth-talking guide, trying to uncover the perpetrator of the crime. He is unable to solve the mystery in Olympia, however, and must travel alongside the “Tracks and Temples” tour through more Greek cities–and more murders–until he can catch the killer. Corinth, Delphi, and Athens all enjoy a visit from the Falco family, and Lindsey Davis enlightens us on the shady practices associated with the Greek oracles. 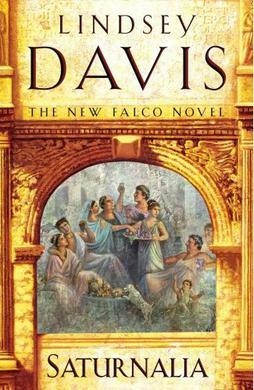 Saturnalia sees the Falco family back in Rome in time for the holidays. Marcus is called in by the emperor’s minions to solve a political debacle wherein the Germanic priestess Veleda has escaped from custody (after allegedly beheading a man) and is hiding somewhere in the city of Rome. This is the same Veleda that Helena’s brother Justinus took a shine too back in The Iron Hand of Mars when he ascended her tower and convinced her to free Falco and the other Roman soldiers. Marcus must not only apprehend Veleda before the end of the year, but he must do it in such a way that he protects Justinus from becoming an accessory to her escape. In Saturnalia Lindsey Davis sheds light on the ancient practices of medicine and surgery. Four different schools of Roman physicians are represented, all doctors attending the hypochondriacal house where Veleda was being held. Marcus is the prototypical Roman Scrooge during Saturnalia, the “Season of Misrule” in Rome, and cannot wait for the holiday–and his case–to come to an end. I love the Falco books. It’s a treat to see them pop up on blogs!